Your First Steps After Suffering a Fairfax Dog Bite | Kearney, Freeman, Fogarty & Joshi, PLLC , according to the American Veterinary Medical Association (AVMA). If you or a loved one has suffered a dog bite, it’s important you understand Virginia law concerning dog bites, what you should do after suffering one, and how a Fairfax dog bite lawyer can help you if you decide to seek damages. 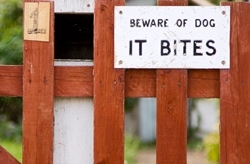 Virginia operates under what’s called the “one bite rule.” This holds a dog owner liable for any damages his dog causes if he knows that the dog has bitten someone before and is likely to cause harm to another person or dog. This rule also applies if an owner knows his dog has previously caused injury from jumping. If a dog does not have a history of biting or jumping but causes someone injury, the victim can still attempt to seek compensation under the rule of negligence “per se.” This is defined as “a negligent act that violates a law that has been designed to protect the public.” A plaintiff must be able to prove negligence on the part of the owner who had a duty to reasonably restrain the dog but failed to do so properly. For example, if a dog was off the leash at a public park and bit someone, the victim may pursue damages by trying to prove negligence. In Virginia, any claim filed against a dog’s owner must be filed within the time limit set by the statute of limitations. For all personal injury claims in Virginia, including dog bites, the claim must be filed within the two years following the date the injury occurred. Record important information. After a dog bites you, get the owner’s name, phone number, address, insurance information (usually a homeowner’s policy), and email address, as well as the dog’s name, breed, age, and weight. In addition, record the time of the attack, and cite whether or not the dog was restrained. Call law enforcement. Asking the police or animal control to investigate the incident serves to record further information. This will assist you when it comes time to file a personal injury claim. Refrain from apology. It’s important to say as little as possible, except for what helps you gain information. If you apologize, even out of habit or as a courtesy, it may affect your claim and fault later. Document the incident. If you can, take pictures, record witness statements with your phone, and get contact information from any witness. If you’re too badly injured and someone is with you, ask her to document while you seek medical attention. Seek immediate medical attention. Right after a bite, see a doctor. Not only does this show insurance companies and a court that you take your injury seriously, a doctor visit reduces the chance that you’ll suffer a serious infection or further injury later on. Find legal help. A dog owner may adopt a number of defenses—for example, saying a bite victim provoked the dog in some way—and you may need experienced legal help to win fair compensation for your injury. Stay quiet on social media. Although it may be difficult, refraining from posting on social media and talking to friends or adjustors about the incident will help your claim. Insurance adjusters perform online and in-person surveillance to determine whether or not your claim is legitimate. If you or someone you love suffered injuries from a dog bite, you may have questions about if or how you should proceed with filing a personal injury claim. The legal team at Kearney, Freeman, Fogarty & Joshi can evaluate your case, help you understand the law, and advise you on your next steps. To speak with a member of our Fairfax dog bite lawyers today, give us a call at 877-652-1553.